SAN JUAN CAPISTRANO, Calif. (BRAIN) — Welcome to August. August 15 is the deadline for brands to submit products for consideration for Interbike's IB Innovation Awards. Bicycles, components, accessories and apparel can all be nominated. SAN JUAN CAPISTRANO, Calif. (BRAIN) — Interbike has opened registration for the third annual Mechanics Challenge presented by Park Tool. The event will take place on the Interbike show floor with qualifying heats on Sept. 18-19 and the semi-final and final rounds held from 2-5 p.m. on Sept. 19. PORT WASHINGTON, N.Y. (BRAIN) — The NPD Group will offer two free product category sales report to retailers attending Interbike. 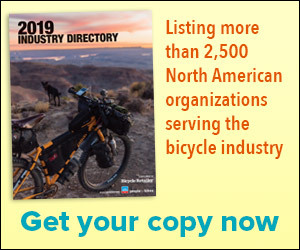 SAN JUAN CAPISTRANO, Calif. (BRAIN) — Interbike says more than 75 brands will participate in its Outdoor Demo at the Northstar California Resort. BOSTON (BRAIN) — The Serotta International Cycling Institute is offering a three-day Personalized Fit course with an option to get bike fit certified at Interbike. The three-day Personalized Fit certification course starts on the last day of the trade show, Thursday, Sept. 20, and runs through Saturday, Sept.
BOULDER, Colo. (BRAIN) — The Bicycle Product Suppliers Association has worked with Interbike to develop an expanded Supplier Seminar Series during the show this fall. SAN JUAN CAPISTRANO, Calif. (BRAIN) — Retailer education provider Mann University will return to Interbike with a two-part seminar titled "Inventory Planning for Bicycle Retailers." Each 90-minute Mann U Lunch & Learn session will occur from noon to 1:30 p.m. on Tuesday, Sept. 18, and Wednesday, Sept.
SAN JUAN CAPISTRANO, Calif. (BRAIN) — Interbike has announced the addition of a new featured area of the expo located just outside the doors of the Reno Sparks Convention Center. RENO, Nev. (BRAIN) — What are the room rates for Interbike attendees at block hotels? What does it cost to eat in Reno? What are the transportation options? How far are host hotels from the Reno-Sparks Convention Center? SAN JUAN CAPISTRANO, Calif. (BRAIN) — Interbike has announced the addition of a new educational track whereby key retailers will share their experiences on specific topics relevant to all IBDs today.